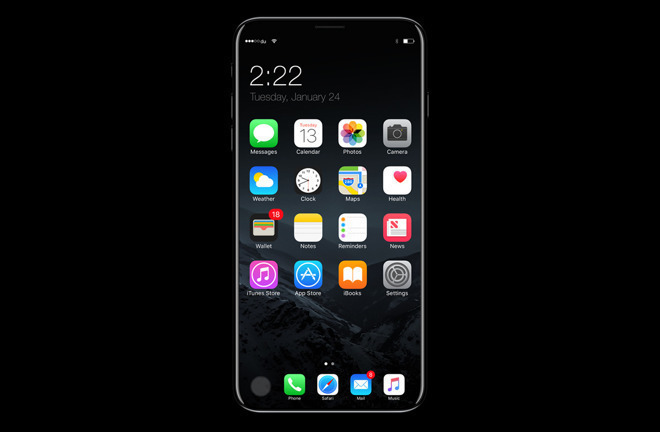 Straying from the pack a bit, one analyst believes that the "iPhone 8" will ship before the end of September, but in profoundly limited quantities, but the largest measure of Apple's profits from the device will accrue throughout the calendar year. In an investor's note seen by AppleInsider, Rod Hall from J.P. Morgan continues to support the concept of a "super cycle" after the "iPhone 7s" family and "iPhone 8" launch. However, because of possible OLED screen issues related to Touch ID, launch quantities will likely be constrained. Original J.P. Morgan estimates pinned 9 million "iPhone 8" units available for launch and for sale before the end of September. Hall believes that the actual number is now closer to 2 million because of unspecified production problems, and has shifted quarterly unit forecasts accordingly. In the short term, the relative lack of unavailability at launch and in the early days of the fiscal quarter ending in September will have a temporary effect on average selling price. Hall believes that the average selling price will not hit the peak of $681 as they predicted, but will be around $629. The holiday quarter, Apple's first quarter in the 2018 fiscal year, is another matter. Hall believes that the average selling price through fiscal year 2018 will dramatically climb to $759 from a previous guess of $717. Other than just a holiday quarter shift, other changes in estimate reasoning surrounding increased iPhone demand have grown fiscal year 2018's predictions by the firm upwards by $17 billion over previous estimates, at the cost of a decrease of $7 billion in the fourth quarter of 2017. It is not clear if Hall's data about lower initial production volumes of the "iPhone 8" is independently sourced, or gleaned from other published reports. Also not clear is how the estimated two million compares to the low quantities shipped of the iPhone 7 Plus at launch.